How is a pool built? In this article we will look at some of the basic types of pool construction. Once you know the different ways in which a pool builder can work, then you should have a better idea about what type of pool will suit you best. There are two basic approaches to building a pool. 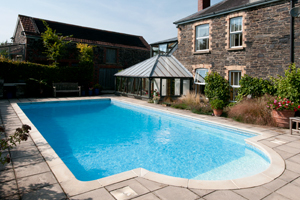 In-ground pools are sunk into the ground – as the name suggests – and are made from reinforced concrete. The pool builders will then line the pool in various ways. In-ground pools are more expensive and take longer to build but will last much longer and can be any manner of shape or form. Above-ground pools are built by raising a steel frame and then lining that frame in order to make the pool. An above ground pool could be tackled as a DIY project so avoiding the need to use specialist pool builders, but it is a challenging task for even the most skilful DIY enthusiast. To build an in-ground pool, the first thing you start with is a large hole. The pool has to be excavated and the earth used either to landscape the site or be taken away. This is obviously a job for heavy machinery and so access to your chosen site might be an issue that dictates your options on how your pool might be built. Next, the pool builders will line the excavated pool in concrete, either by using concrete poured or sprayed onto reinforcing bars or by building a block wall and poured cement floor. The pool then has to be made watertight and given an attractive and practical finish. Vinyl liners are particularly popular in the UK. The liner has a life expectancy of about 20 years and can be replaced after that time. The vinyl can come in a range of colours and non-slip, algae resistant surfaces. Alternative finishes would include specialist paint or a plastered finish made from plaster cement and marble dust. Mosaic tiles are also a popular option for pool builders to install. All these finishes have their advantages and drawbacks and in the main it’s fair to say that the more expensive options give you benefits of range of colour and design, coupled with a longer life span. The above-ground option that a pool builder can take is to raise a frame of galvanized steel that is then used to support a vinyl liner. This is a cheaper and quicker building method and if you have serious access problems to your chosen site it may well be the only solution. As with a sunken pool, the ground has to be prepared but in this instance all that is needed is to ensure that the surface is flat, stable and level. Above-ground pools might be as small as a 10 meter circle or as large as 30 meters along their longest side but in each case the supporting frame is raised and then a vinyl liner is hung from that. There may also be a relatively small area of raised pool-side decking that the frame supports. Most above-ground pools are about 4 feet deep so the finished structure will certainly stand out in your garden. Thoughtful choice of design and some well-considered landscaping can make all the difference and above-ground pools also have the advantage of being able to move with you when you move home. Swimmer Pool Kits take the worry out of specifying exactly the pool that you want. They bring together all the heating and water filtration equipment that you will need and they use a modular construction method that is both quick and dependable. Swimmer Pool Kits contain everything that will be necessary for the pool of your dreams. The methods of building a pool that we have described above are only one small part of the job. Building a finished swimming pool will also include a great deal of plumbing and electrical work, all of which needs to be done to the highest standards of safety and accuracy. There are obvious advantages in getting your pool built by professional pool builders. A professional contractor will have years of expertise and know-how, and will often be able to finish a job far more quickly than you, plus they will have access to specialist tools and knowledge that you simply do not. SPATA (Swimming Pool and Associated Trades Association) vets its members to ensure that they are competent, professional and up to date in their methods and workmanship. We hope this article has given you some of the information that you were looking for. If you are now looking for a pool builder then we can help with that as well, just use the link at the top of this article and we can find someone with the appropriate skills and qualifications in your area.